This article is about bib-and-brace overalls, also called "dungarees". For coveralls (boilersuits), see Boilersuit. For other uses, see Overall (disambiguation) and dungaree. An overall, over all, overalls, bib-and-brace overalls, dungarees or party bibs are a type of garment which is usually used as protective clothing when working. Some people call an overall a "pair of overalls" by analogy with "pair of trousers". 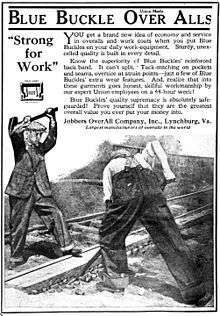 A 1920 advertisement for Over Alls, published in the Brotherhood of Maintenance of Way Employees Journal, depicts railway workers adjusting track. Construction worker wearing an overall. Overalls are usually made of denim and often have riveted pockets, similar to those on jeans. Bib overalls have long been associated with rural men and boys in the Southern United States and the Midwestern United States, especially farmers and railroad workers. They are often worn with no shirt at all by children, teen boys and men in warmer weather. 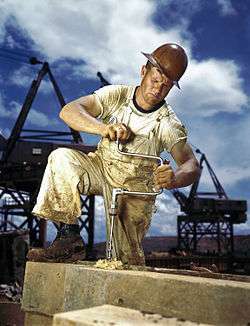 All over America in modern times, painters, farmers, certain factory workers, some train locomotive engineers, carpenters and other tradesmen or workmen often wear overalls as protective overgarments. Since the 1960s, different colors and patterns of bib overalls have been increasingly worn by young people of both sexes, often with one of the straps worn loose or unfastened along the side and under the arm. The bib overalls fashion trend among American youth culture peaked in the latter half of the 1970s, and again for females in the late 1990s. In the 20th century, overalls were also sometimes worn as casual clothes, due to their comfort, handiness and durability. Overalls are also made in corduroy in addition to denim, and come in many styles. In British English such bib type overalls are usually called pairs of dungarees. Shortalls are a type of overalls in which the legs of the garment resemble those of shorts. The word is a contraction of these two words. They are often worn during the summer. Also seen now are skirtalls which are like shortalls except that the bottom of the garment resembles a skirt. Sometimes it could be capri overalls which are a type of overalls whose legs are like the legs of capri pants. Shortalls designed for toddlers often have crotch and leg snaps to facilitate diaper changes. Salopettes for a motorcycle driver. Salopettes is the French word for bib-and-brace overalls. The word is used in English for a similar garment worn for instance for sailing, skiing, diving and other heavy duty, consisting of wind-proof/waterproof trousers traditionally with a high waist (bib) reaching to the chest and held up by adjustable shoulder straps/braces. Look up overall, boiler suit, or shortalls in Wiktionary, the free dictionary.